Halloween was originally a Celtic festival celebrating the end of summer and has been celebrated ever since in various guises all over the world. 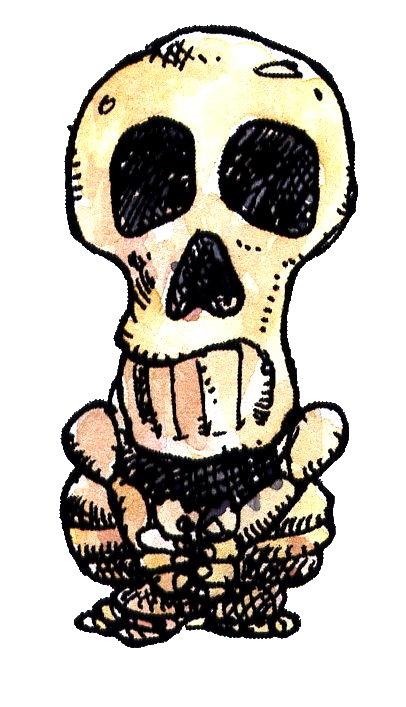 Halloween is a shortening of "All Hallow's Eve" - because it's the evening before All Hallow's Day (All Saint's Day) on 1 November. Halloween is also a time of parties and partying - which neatly brings me to Halloween-themed murder mystery parties. Here I've listed the murder mystery parties that I think are particularly suitable for a Halloween bash. My criteria for choosing is straight forward - if it has "spooky" elements (or has great opportunities for costuming), then I've listed it. Set in the modern day, Hollywood Lies takes place during the Halloween-theme costume party for The Vampire Detective, a fabulously successful horror movie. 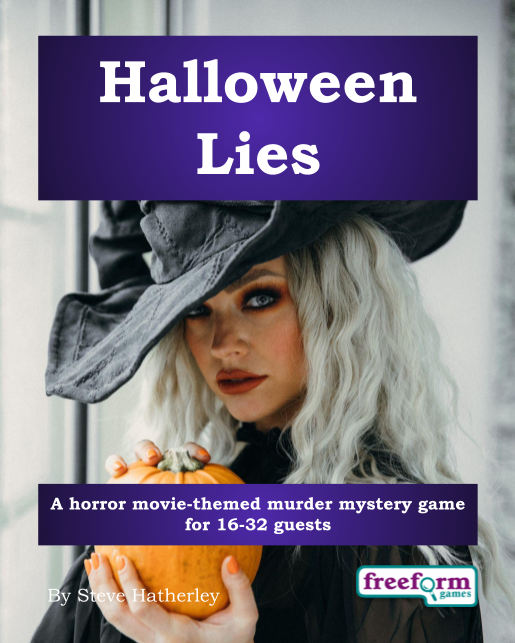 Halloween Lies is for 16 to 32 guests (plus the host), and costs from £25.00. Click here to learn more about Halloween Lies. It's 1984 and Sir William Saville is throwing a dinner party to celebrate his latest discovery - a previously undiscovered Egyptian tomb. Egyptian magic, artefact smuggling and an ancient curse - it all happens in Curse of the Pharaoh. 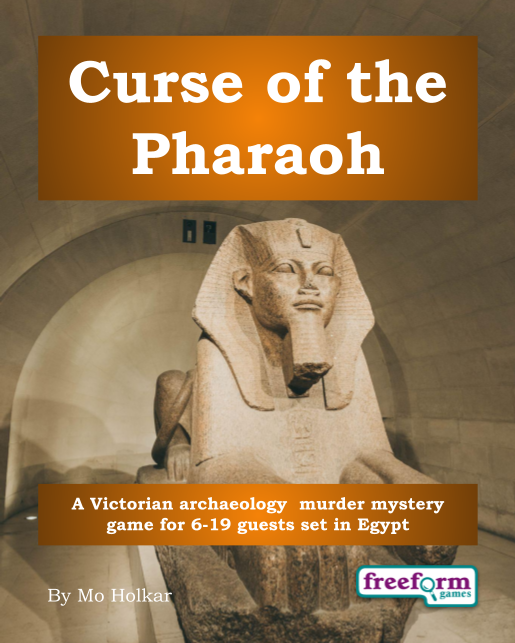 Curse of the Pharaoh is for 6 to 19 guests (plus the host), and costs from £20.00. Click here to learn more about Curse of the Pharaoh. 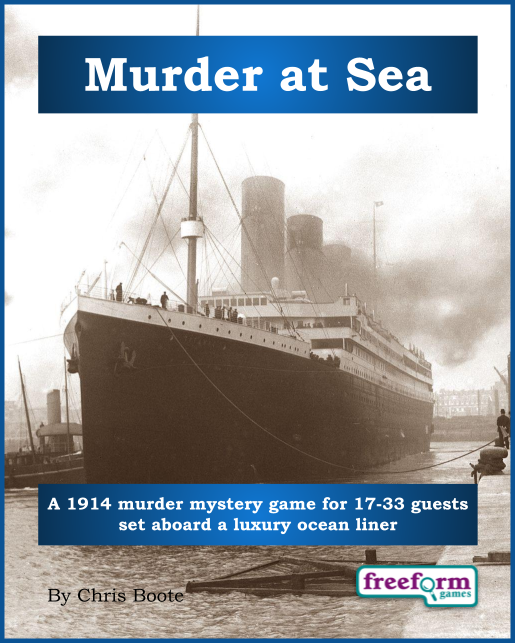 It is 1914 and as war is declared in Europe the Captain of an Atlantic luxury cruise liner is murdered in front of the passengers and crew. Diplomats, officers, businessmen, journalists and more are all mixed up in this shipboard murder mystery. Murder at Sea is for 17 to 33 guests (plus the host), and costs £30.00. Venture into the heart of the Dark Continent in this 1939 murder mystery party set in Africa. 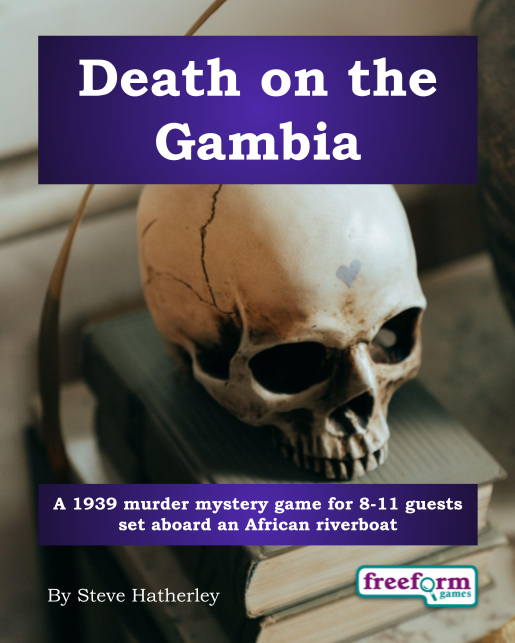 Death on the Gambia follows a tramp riverboat as it sails along the River Gambia in Africa. Aboard are a curious mixture of passengers - a big game hunter, a missionary, a doctor, a journalist, an archaeologist - and a hint of dark magic.